Tea made from birch helps in the treatment of a wide variety of health problems, and that is equally true for its bark or leaves. This soothing drink is prepared across the globe and is an integral part of the tradition and folk medicine. The birch is used as an essential component in other herbal mixtures, which have a diuretic effect, and it is also known to accelerate wound healing and tissue rejuvenation. 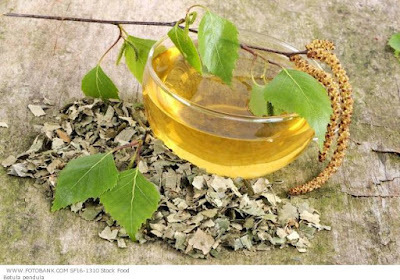 In addition to medicinal tea, in Phytotherapy natural juice of birch is especially praised - which we receive directly from the tree, then we have oil, gel and tincture, whose recipes we will be glad to share on this occasion. Birch, Latin name is Betula Pendula, is one of the most popular plants that have always been used in the treatment of many health problems, but the best results are obtained in cases of kidney and skin diseases. This herb is rich in flavonoids, which have an extremely beneficial effects, but besides them it contains essential oils, tannins, saponins and vitamin C. In our folk medicine birch as a remedy was used to quickly dissolve kidney stones and in cleaning the deposited silt. Medicinal tea from birch is successfully used to prevent the excess water in the body: the kidneys, bladder, liver and joints. In addition, this plant rejuvenates tissue and accelerates the healing of deep wounds. Leaves act as a mild disinfectant so they are used against muscle stiffness, rheumatism and gout. Thanks to the valuable flavonoids, birch tea promotes kidney filtration, and also help in cases of heart disease. It is also has antibacterial and antiviral effect in cases of inflammation and allergies. In folk medicine, birch tea is prepared for the treatment of atherosclerosis and menstrual problems, and is recommended for obese people because birch tea promotes weight loss. This plant strengthens the cardiovascular system and lowers blood pressure. The inner part of birch bark stimulates the liver, because it facilitates the secretion of bile. Apart from young birch leaves, which are used for tea, juice has medicinal properties as well, which is obtained by incising the bark. It contains a lot of organic acids, but it is used as an extremely refreshing tonic. Pour three tablespoons of dried birch leaves with seven decilitres of boiling water and let it stand covered for 60 minutes. Strain medicinal tea and drink three times a day without sugar. Mix equal parts of birch leaf, creeping twitch, speedwell and chicory root, and three tablespoons of this mixture pour with seven dl of boiling water and leave it covered to stand for at least an hour. Strain and drink medicinal tea for the kidneys three times a day half a pint, always before eating. Mix 3 tablespoons of birch bark and 2 tablespoons of elder blossom, and pour three decilitre of boiling water and let it sit covered for at least 10 minutes. Then strain, sweeten with natural honey, add 2 tablespoons of lemon juice and drink every two hours in a few sips. Mix equal parts of birch leaf, flower coltsfoot, horsetail and a bearish grapes, and 3 tablespoons of the mixture pour with 0.7 litres of boiling water and leave it covered to rest for a good half an hour. Strain and drink three times a days, always before eating. Mix equal parts of birch leaf, rosemary, nettle leaf, field horsetail and blueberry leaf, three tablespoons of mixture pour with seven dl of only boiling water and leave it covered for a good half an hour to rest. Strain and drink three times during the day, always before eating. Mix equal parts of birch leaf, nettle leaf and bark of buckthorn, and three tablespoons of mixture pour with 0.7 dl of boiling water, cover and leave it covered to stand for half an hour. Strain and drink the tea three times a day, always before eating. Fill 2/3 of the glass jars with fresh birch leaves, and pour homemade brandy, the best is plum brandy. Seal the jars and allowed it to stand for 21 days. Strain and add half a decilitre of apple cider, and take 10 or 15 drops of the tincture 3 times a day, depending on the problem. Fresh birch juice like birch tea is extremely healthy and appreciated in Phytotherapy. It needs to be aggregated first by creating an incision from the old birch bark, and then a corresponding funnel is inserted through the opening, through which the juice flows out in a clean glass container. After removing the juice, the opening should be closed with a wooden wedge, and from one tree birch in a whole day, you can collect up to four litres of juice. However, to drill often the same tree, it is not recommended because it also reduces the resistance of wood to fungal infection. So be wary of this. We need to say that not only fresh juice and tea of ​​birch are recognized in natural medicine as effective, there are numerous other preparations. They are most commonly used to treat skin diseases, eczema, burns, eczema and wounds. In addition, externally applied preparations are used in the case of injury, inflammation of the skin, burns, insect bites, haemorrhoids and vitiligo. Birch rejuvenates the skin and restores its elasticity and its precious ingredients mitigate harmful effects of UV rays. Also, from birch salves are made against hair loss and dandruff. Here is another great recipe for weight loss that you definitely need to try. Prepare a hot water bath and to it therefore deliver fresh birch leaves in proportion of two litres of water and a handful of leaves. Get in the water while it is still warm, and spend twenty minutes in it. If birch tea is combined, as well as medicinal oil and gel from this plant you can get the most effective treatment against cellulite that is a nightmare to many ladies. This plant from our organism successfully removes excess water and toxins, including uric acid. That is exactly what accelerates the quick removal of cellulite and propagates slimming process, and it increases the tension and elasticity of the skin and surrounding tissues. After spending time in nature, always take a shower and wash your hair, because it can contain a lot of pollen. If you walk your pets, you need to brush them well when you return home. If you are allergic to pollen, regularly wash your bedding at least once a week. On the pillowcases and sheets (sheets) pollen can be found in large quantities. Shake pillows and other bedding. Ventilate the room regularly, but always later in the evening, because concentration of pollen in the air is far less in that period. Remember this well- do not ventilate in the morning, you will make a counter effect, because then the concentration is extremely high. Is it advisable to use ​​birch tea during pregnancy? Pregnant women should not drink birch tea, as well as women who are breast feeding because the birch is a rather strong allergen. It is certainly desirable to consult with professionals about this issue.